José Mário dos Santos Mourinho Félix was born on the 26th January 1963, in Setúbal, Portugal. He is a professional football (soccer) coach who is currently the manager of the leading English club Manchester United in the English Premier League(EPL). He has previously coached other teams including Porto, Chelsea, Inter-Milan, Real Madrid and others. Jose Mourinho has been working as a coach since 2000. How much is the net worth of Jose Mourinho? It has been estimated by authoritative sources that the outright size of his wealth currently stands at $28 million, as of the data presented in mid-2016. To begin with, Jose was born into the family of professional football player José Manuel Mourinho Felix, and primary school teacher Maria Júlia Carrajola dos Santos. Since early childhood Jose was into football, and played it while studying in high school and college. He graduated from the Technical University of Lisbon, earning a degree in Sports Science. At the beginning of the career, Mourinho worked as an assistant and interpreter for English coach Bobby Robson in the Portuguese clubs Sporting Lisbon and FC Porto. He then followed Robson to Spanish FC Barcelona in 1996, before in 2000 starting his career as the coach of Benfica, but left the club after nine games because of club politics. The season of 2001 – 2002, he trained the Portuguese club União de Leiria, which ended in fourth place in the league, and then he was brought to FC Porto. In 2003, Jose won his first league trophy as FC Porto ended 11 points ahead of Benfica. In addition, the same year the club won the Portuguese Cup and the UEFA Cup. In June 2004, Mourinho went to Chelsea with several aides from Porto, and quickly purchased new players. From December Chelsea topped the league table and participated in the play-offs of the Champions League. In February 2005, the club won the League Cup final in Cardiff, where they beat Liverpool 3 – 2. In March 2005, Mourinho got two match ban and a fine because of criticizing the referee Anders Frisk after a Champions League loss to FC Barcelona. One month later, Chelsea celebrated its first league title in 50 years. The following season Chelsea again won the English league, but Mourinho’s career at Chelsea ended after 1 – 1 result against Rosenborg in the Champions League 2007 – 2008. Of course his net worth had risen considerably with his success. In 2008, he accepted the coaching job at Inter Milan, where he took over from Roberto Mancini. In the middle of 2010, Inter won over Bayern Munich 2 – 0 in the Champions League final, and then Mourinho won the Italian league championship and the Italian Cup, thus becoming the first manager in Italy to win the triple. 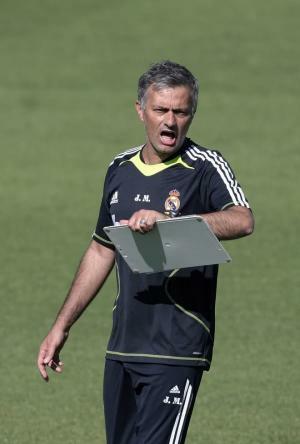 In the middle of 2010, Mourinho became the coach of Real Madrid, and won the Copa del Rey and Liga BBVA with the club. In 2013, Mourinho was appointed as Chelsea coach for the second time. This period of the career, Jose describes as the worst one, despite winning the ’14-’15 League title, and League Cup, but a poor start to the ’15-’16 season saw him sacked in December 2015. However, on 27th May 2016 it was announced that Jose Mourinho had been appointed as Manchester United’s new manager. Finally, in the personal life of the coach, he married Matilde Faria in 1989, and they have two children. Children Matilde Mourinho, Jose Mario Mourinho Jr.
1 Football is a more beautiful game in high definition. 3 Ferguson is right. Money does not guarantee success. I showed that last season when my Porto team beat Manchester United. 4 "Football is a game about feelings and intelligence. Everybody can be smart. The trick is not believing the other's stupid." - as Porto's manager. 5 "It's hard to keep up with my ego, but the players just have to live with it". - after a couple of months as Chelsea's manager. 6 "We have top players and - I apologize if I sound arrogant, a top manager". - presenting himself as Chelsea's new manager. 3 Chews gum to help his concentration. 4 Friends with sir Alex Ferguson. 5 Won the champions league as assistant manager of Barcelona. 6 Left Chelsea by mutual consent in 20th September 2007 and replaced by Avram Grant. 7 Children: Matilde and José Mário. 8 Son of goalkeeper Félix Mourinho and Maria Júlia.